Insulation: Naturaloft insulated concept: 600 fill power of 70% goose down 30% waterfowl feathers all around the hand. Hydrowick microdenier lining with thermo-plush in the cuff and ultra-breathable, waterproof, windproof Aquabloc insert. Features: Aquabloc, Naturaloft, gauntlet cinch closure palm and thumb reinforcement. Gordini has been in the outdoor business since 1956 and has been striving to create products to keep your body\xCDs heat production and heat loss in perfect balance. Their team of winter sports enthusiasts based in Vermont and Canada will settle for nothing less than perfection when it comes to creating quality and functional products that combine proven natural materials with the latest in synthetic technology. The result is the best products to keep you warm and dry in the toughest conditions. GORE-TEX® technology keeps water out of our gloves, while allowing moisture from the inside (perspiration) to easily escape. The result is a glove that’s highly breathable and totally waterproof. The microporous structure of the GORE-TEX® membrane is what makes GORE-TEX® products completely waterproof. Each microscopic pore is about 20,000 times smaller than a drop of water, which means no external moisture — from rain to snow — can penetrate the membrane. The pores in the GORE-TEX® membrane are 700 times bigger than a water vapor molecule, so perspiration can easily evaporate through and you can stay dry from the inside out. GORE-TEX® Guaranteed to Keep You Dry®. Engineered by Gordini® to combine the warmth of wool with the comfort and wicking superiority of fleece, Lavawool® in independent tests outperforms 100% wool and leading synthetic fabrics. How? Lavawool® utilizes the inherent insulating properties of wool to keep you warm; but, unlike pure wool, which absorbs and retains moisture, Lavawool® wicks moisture quickly from your skin and garment with its patented weave of synthetic fibers and wool. This marriage of fibers is the Lavawool® advantage — keeping you drier and warmer wherever your cold weather adventures take you. Naturaloft® is a goose down insulating concept. 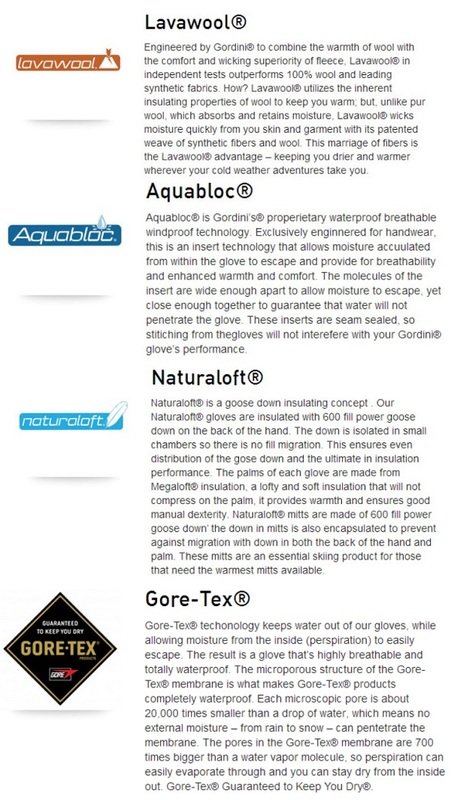 Our Naturaloft® gloves are insulated with 600 fill power goose down on the back of the hand. The down is isolated in small chambers so there is no fill migration. This ensures even distribution of the goose down and the ultimate in insulation performance. The palms of each glove are made from Megaloft® insulation, a lofty and soft insulation that will not compress on the palm, it provides warmth and ensures good manual dexterity. Naturaloft® mitts are made of 600 fill power goose down; the down in mitts is also encapsulated to prevent against migration with down in both the back of the hand and palm. 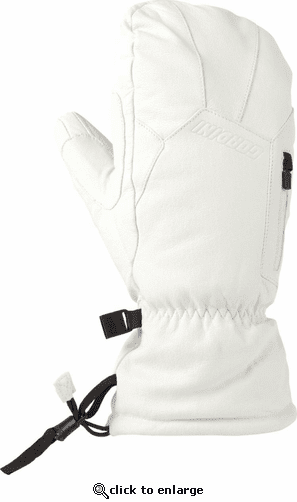 These mitts are an essential skiing product for those that need the warmest mitts available.